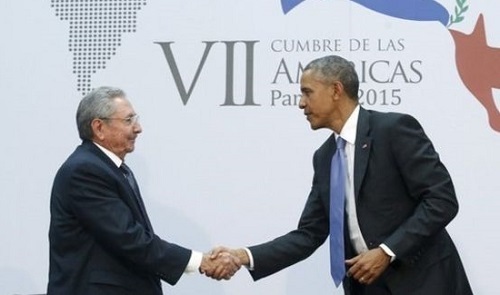 The United States has removed Cuba from its list of state sponsors of terrorism. The move eliminates a major obstacle toward restoring diplomatic ties. The change now allows Cuba to conduct banking in the United States, among other activities. The removal has been one of Cuba's key demands, as leaders from both countries have repeatedly met to negotiate the details of restoring diplomatic relations, including the opening of embassies in Washington and Havana. Last week, diplomats met in Washington, but failed to come to an agreement on opening embassies.